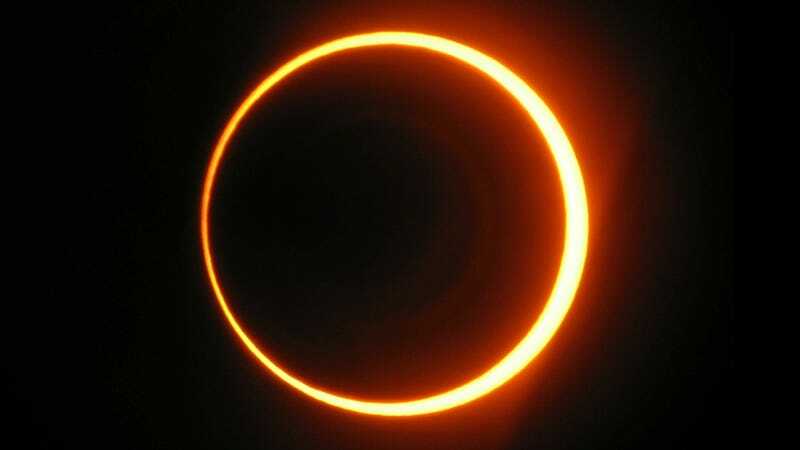 This weekend, the Moon will pass between Earth and the Sun, giving rise to what sky-watchers call an annular eclipse. Also known as a "ring of fire" eclipse (for reasons that the top image should make clear), it's the first annular eclipse to be visible from the continental U.S. in close to 20 years. Here's what you need to know to catch a glimpse. What is an "annular" eclipse? Remember the supermoon from a couple weeks back? If you do, you might recall reading that one of the things that made the Moon "super" that night was its proximity to Earth. Because the Moon's orbit is elliptical, there are times throughout the month when it is closer to our planet than others. Two weeks ago, the Moon was at perigee, putting it closer to us than any other point in the month. In contrast, Sunday's Moon will be close to apogee, the point in its orbit at which it is furthest from our planet. The Moon's distance from us means that its apparent diameter in the sky will be at its smallest for the entire month, so when it passes between the Sun and the Earth on Sunday night, it won't be able to cover the whole sun. As a result, some parts of the country will be able to witness a ring of sunlight like the one pictured up top, a defining characteristic of annular eclipses. The eclipse will last from 20:56 UTC on May 20th til 02:49 UTC on May 21st (that's 16:56 to 22:49 EDT, or 13:56 to 19:49 PDT on May 20th), and will be visible from China to the easternmost regions of North America. This map, created by Eclipse Maps' Michael Zeiler, illustrates when and where you can expect to catch the eclipse. As a general rule: If you're in North America, the further west you are the better. There's a band running across Zeiler's map labeled "Path of the annular solar eclipse." These are the regions of the Earth from which the Sun's "ring of fire" will actually be visible (to everyone else, Sunday's will look much like any other partial solar eclipse). Of course, most people don't live along this narrow band of the United States (or anywhere else along the path of the annular eclipse, for that matter). But that's okay; you can always watch it online. Your best bet is probably to check out the SLOOH Space Camera, which will be streaming feeds form telescopes along the annular path in Japan, California, Arizona and New Mexico beginning Sunday at 5:30 p.m. EST. SLOOH even has it set up so you can take pictures of the eclipse as it unfolds. One of the benefits to watching the eclipse online, rather than in-person, is not having to worry about taking precautions when actually viewing the eclipse. Looking directly at the Sun — even during an eclipse, and, yes, even with sunglasses — is an awful, awful idea, and can permanently damage your vision. To safely view the eclipse, you'll want to go buy a solar filter. These come in a variety of forms, from wearable solar shades, to attachments that you can affix to telescopes and binoculars. They'll cut the brightness by enough that you'll be able to catch glimpses of the Sun without frying your retinas. Poke a small hole in an index card with a pencil point, face it toward the Sun, and hold a second card three or four feet behind it in its shadow. The hole will project a small image of the Sun's disk onto the lower card. This image will go through all the phases of the eclipse, just as the real Sun does. Experiment with different size holes. A large hole makes the image bright but fuzzy; a small hole makes it dim but sharp. the ever-popular pinhole projector technique. More advanced projection methods involve the use of a cardboard box, or the room of a house with a sun-facing window. You can click through for more details.